Over the past few months, numerous students expressed concern over their choice to become a journalist in the face of great uncertainty regarding the future of the news industry. I tell them it is like looking at an ancient forest after a horrendous fire, similar to those going on right now across North America. Yes, it looks bad, really bad. Everything that has existed for so long is destroyed. But, if you listen to scientists, they will tell you that Mother Nature is simply doing her thing. It is natural for forests to burn down. This creates room for new growth. It feeds the soil. It nurtures fungi that grow off the dead trees. Some pine cones won’t open unless they face the high temperatures found in a forest fire. Aspen, raspberries and roses sprout vigourously. The woodpecker population can increase fifty times after a fire because they feast on the insects that appear in the burned out trees. This is what is going on in the news media, I tell them. Right now, things look really bad. Jobs are being cut. The demands of the newsroom are intense as many of them try to do more with less people. The quest for a viable economic model is as elusive as the Holy Grail. The old advertising configuration, which has sustained the industry for more than 100 years doesn’t work well anymore. All kinds of new ways of funding journalism, such as non-profits, sponsored journalism, crowdfunding and so forth, are emerging, but not generating the safe, secure kind of income journalists in mainstream media enjoyed in the past. 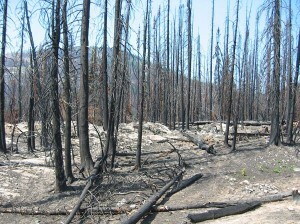 Still, just like the forest, it is important not to get too focused on the charred trees. Instead, look for the new growth. Try to find those little shoots of opportunity sprouting up through the ashes. For young people, there are untold possibilities. Sure, the chance to work at a mainstream news operation still exists. But, it will definitely be harder to score such a plum job. More likely, there is a chance to call on the wide array of skills to create something new and thrilling, using creativity and an innovative spirit. Rather than doing one, single boring job, the possibility of undertaking projects both short and long term exists. The freedom to explore one’s talents and apply them to varied situations is real. Flexibility. Adaptability. Those will be the cornerstones to a journalism career now and in the future. None of this is new. Many journalists and journalism educators have written similar things. The cynics will say this approach is Pollyanna. But this is fed by disillusionment and nostalgia. There is always room for great journalism based on traditional values of excellence, balance, fairness and accuracy. The need for a watchdog has not changed. Journalism done in public service is never old. It may be scarce, but the demand is never-ending. If anything, it is a great time to get in on the ground floor of a major revolution. Now, how epic is that! Well said, I like this statement a lot: It is natural for forests to burn down. This creates room for new growth.